Nepal is a heavenly abode on earth surrounded by lofty heights of the Himalayas. It is truly a land of breathtaking beauty and innumerable attractions. This beautiful country is home to eight of the ten highest mountains in the world, including Mount Everest - the world’s highest mountain peak. Upon arrival at Kathmandu, meet and greet by our representative who will transfer you to to the hotel for check-in. Kathmandu: The Kathmandu Valley, the political, commercial and cultural hub of Nepal, is the first for the majority of visitors to Nepal. Once a separate kingdom in itself, it contains three fabled cities – Kathmandu, Patan and Bhaktapur. Each is an artistic exposition of graceful temples, elegant palaces, brick paved courtyards and quaint streets. Afternoon, leave to visit Hanuman Dhoka (Durbar Square), built between the 12th and the 18th centuries, this complex of palaces, courtyards and temples is the historic seat of royalty. It used to be the seat of ancient Malla kings of Kathmandu. The durbar Square, protected as a UNESCO World heritage site, epitomizes the religious and cultural life of the people. Other than a 17th - century stone inscription set into the wall of the palace with writings in 15 languages, interesting things to see here are: Taleju Temple (Built by King Mahendra Malla in 1549 A.D., Kal Bhairav, the god of Destruction Nautalle Darbar, Coronation Nasal Chowk, the Gaddi Baithak, the statue of king Pratap Malla, the big bell, big drum, the Jagannath Temple and three museums including the numismatic museum and the Tribhuvan Museum. Swayambhunath (Samhengu): Listed as a world heritage site, this is one of the world's most glorious Buddhist sites in Nepal. Its established is linked to the creation of the Kathmandu Valley out of a primordial lake. Three km west of Kathmandu this site is situated on a hillock about 77 m. above the valley. Painted on the four-sides of the spire bases are the all seeing eyes of Lord Gautam Buddha, the founder of Buddhism. After breakfast leave to visit Pashupatinath Temple, Boudhnath Stupa and Patan City. 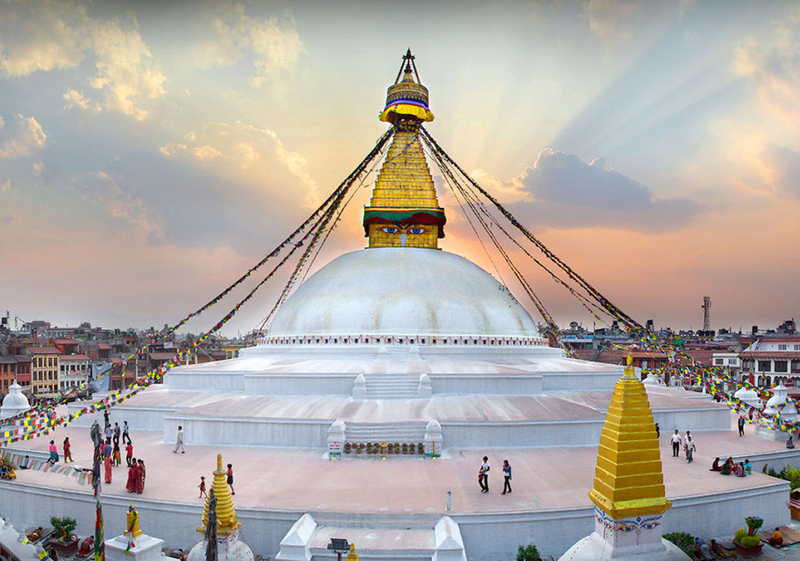 Boudhanath: Boudhanath is among the largest stupas in South Asia, and it has become the focal point of Tibetan Buddhism in Nepal. The white mound looms thirty-six meters overhead. The stupa is located on the ancient trade route to Tibet, and Tibetan merchants rested and offered prayers here for many centuries. When refugees entered Nepal from Tibet in the 1950s, many of them decided to live around Bouddhanath. They established many gompas, and the "Little Tibet" of Nepal was born. 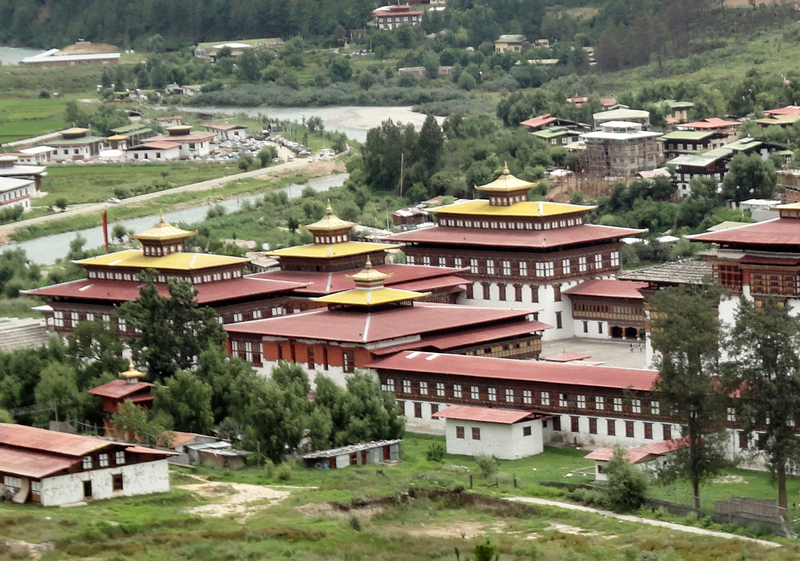 This "Little Tibet" is still the best place in the Valley to observe Tibetan lifestyle. Monks walk about in maroon robes. Tibetans walk with prayer wheels in their hands, and the rituals of prostration are presented to the Buddha as worshippers circumambulate the stupa on their hands and knees, bowing down to their lord. Patan: Durbar Square, Situated I the heart of the city, constitutes the focus of visiorts; attraction. The Square is full or ancient places, temples and shrines, noted for their exquaisite carvinge. The Patan Durbar Square consists of three main chowk an Keshar Narayan Chowk. It was listed in the UNESCO World Heritage Monument List in 1979. Patan Museum:- This museum indside the Durnbar Square specializes in bronxze statues and religious objects. Krishna Mandir:- Built in 1637 AD, the temple of Lord, Krishan holds a commanding position in the palace complex of Patan, Tibetan Refugee Camp: This camp was set up in 1960 under the initiative of the International Red Cross & the Swiss Development Corporation in corporation with HMG of Nepal. Its main objective is to help the Tibetan Refugees to do something nice & support themselves & some carpet industries & handicrafts have been operating. Post hotel proceed to the tranquil valley so called Pokhara. Upon arrival get transfer to hotel, refresh & relax with the spectacular panorama of Annapurna range forming the backdrop. Stretching from the east to west, the Annapurna massif includes Annapurna I to IV and Annapurna South. Although the highest among them is Annapurna I (8091m), it is Machhapuchhre (the fishtail), which dominates all others in this neighborhood. Boastfully levitating in the skyline, the fish-tailed pinnacle is the archetypal snow-capped, needle-pointed mountain. Pokhara: Pokhara is a remarkable place of natural beauty. Situated at an altitude of 827m from the sea level and 200km west of Kathmandu valley, the city is known as a center of adventure. The enchanting city with a population of around 95,000 has several beautiful lakes and offers stunning panoramic views of Himalayan peaks. The serenity of lakes and the magnificence of the Himalayas rising behind them create an ambience of peace and magic. It is part of a once vibrant trade route extending between India and Tibet. To this day, mule trains can be seen camped on the outskirts of the town, bringing goods to trade from remote regions of the Himalaya. This is the land of Magars and Gurungs, hardworking farmers and valorous warriors who have earned worldwide fame as Gurkha soldiers. The Thakalis, another important ethnic group here, are known for their entrepreneurship. The climate of Pokhara is slightly warmer than Kathmandu with daytime temperature hovering around 15 degrees Celsius in winter and 35 degrees in summer. The monsoon season which lasts from mid-June to mid-September is very wet; in fact Pokhara records the highest rainfall in the country. Afternoon visit Pokhara city where is beautiful lake like Begnesh, Rupa and fewa Pokhara museum cave davit fall, Bindebashini Temple and Seti Gorge. Barahi Temple, The Barahi Temple is the most important monument in Pokhara. Built almost in the Center of Phewa Lake, this two-storied pagoda is dedicated to the boar manifestation of Ajima, the protester deity representing the female force Shakti. Bindhyabasini Temple, This is one of the oldest temples in Pokhara. Legend says that when Pokhara was a part of Kaski Kingdom, the main deity of the temple, Goddess Durga, was brought from India. Apart from the peace and tranquility that can be felt in this region, the premises of the temple offers a good view of the Himalaya on a clear day. The temple is in the area of the Bazaar; hence, a journey of the old bazaar can be combined with a visit to the temple. Devis Fall. Davis Fall is the most famous water fall in Pokhara, which comes to its gushing best just before disappearing underground. Seti Gandaki / Gorge: Seti Gandaki and Seti Gorge are other two important places to visit in Pokhara. The Seti gandaki flows right through the city, it runs completely underground at many places. There is a local myth that the entire land of Pokhara floats on the Seti River. Overnight stay at the hotel. After breakfast, drive to Chitwan. Upon arrival at the lodge you will be welcomed & be given brief by the naturalist. Chitwan National Park: Chitwan National Park is the most famous national park in Nepal which offers 450 species of birds including four species of deer, leopard, sloth bear, wild boar & much other wildlife. This park is well known for one horned Rhinoceros & it is a shelter for few Royal Bengal Tigers. Besides this, Chitwan also supports a great variety of flora & fauna. After Lunch, either canoe or elephant ride. Overnight stay at lodge. Whole day full of jungle activities including Jungle walk, Elephant briefing OR Elephant bathing, Village visit OR Tharu Dance etc. After breakfast at hotel you will be driven to Kathmandu, arrive and check-in to the hotel. Rest of the day free to enjoying panoramic view of Kathmandu valley. Overnight stay at the hotel. Today you will get transfer to the International airport to board on your onward flight.